Mabel Lake — our biggest and best-known watery wonder where, at 35-kilometres long, you’ll find plenty of elbowroom and lots of breathing space for family vacations you’ll long remember. Hidden Lake — like the name suggests, this little jewel is hidden in the mountains between Enderby and Mabel Lake. Bring your boat, your tent and a sense of adventure and you’ll have everything you need for a weekend of fun. Three campgrounds with 46 sites make falling asleep to the call of the wild easier than you may think! Baird Lake — further up the road you’ll find Baird, the spot to stop for a quiet paddle and tranquil nights camping under the stars. Canoe or kayak close to the shore amongst blooming water lilies, watch for sightings of local wildlife that may include black bears and the occasional moose. 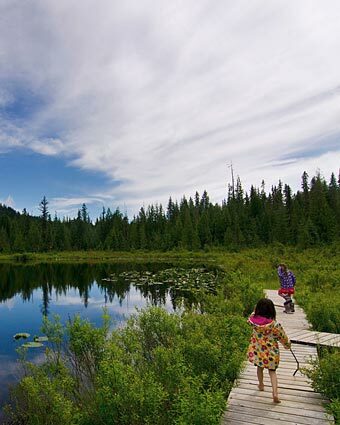 Gardom Lake — A treasure for families if ever there was one! Splash right in and swim for the floating dock just off shore. Pack in a picnic, explore the playground or just sit back and watch your kids play in the sand! Gardom Lake restricts motorized watercraft to those with 10 hp engines, making this one of the best family lakes for canoeing. Paddle out to the islands in the middle of the lake in search of painted turtles and family adventure. 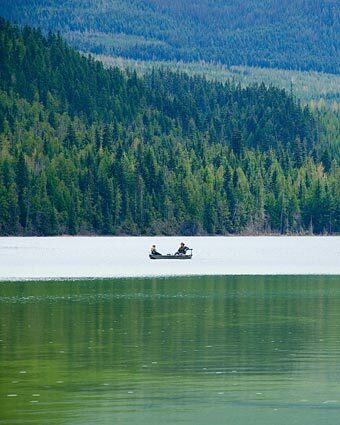 Reeves Lake — Bring your tackle box along on your hike in the Enderby Cliffs Provincial Park and cast your line from its marshy shores angling for trout. Mara Lake — The mighty Shuswap River ends its northern flow at Mara Lake, a family (and pet!) friendly lake just north of town. The day-use park is the perfect spot for a family picnic, canoe ride or simply tossing a stick into the water, just for the fun of watching your pup play retriever. Whether you’re looking to paddle pristine lakes in search of painted turtles, a weekend with the family playing and sleeping along sandy shores, or a quiet morning trying to land a Dolly Varden, the lakes found in our backyard are where memories are made around Enderby. Head out in almost any direction and you’ll eventually find water…set your travel compass for east of Enderby and you’ll wind your way up Mabel Lake Road whose ruts and hairpin turns make just getting to the lake half the adventure. Persevere over the potholes, and you’ll eventually encounter Mabel Lake splayed right where the Okanagan Basin meets the Shuswap Highlands, revealing timeless views of big sky and even bigger water. Travellers have made Mabel Lake their summer destination since the first campsites opened on its shores back in 1928 and there’s a good reason for that…it’s cooler up here! Even on the hottest summer day you can escape the thermometer by hiking the shaded hemlock and cedar forests or by slipping into the lake’s watery depths for a cool swim. Whether you drive in or fly in to the 2,900-ft private air landing strip, sun-soaked fun is what it’s all about at Mabel Lake Resort. No matter where you are on the 35-kilometre lake you’ll feel as though you have it all to yourself, there’s so much room to play. Spend your day wakeboarding, waterskiing and boating its depths then fuel up for tomorrow’s adventures; all of your motorized watercraft needs can be fulfilled at the lake’s two marinas. Ancient pictographs of the Splatsin First Nation, dating back 200 to 400 years can still be found painted in ochre on rocky outcrops surrounding the lake. Go exploring for them by kayak, stand-up paddleboard or canoe and feel your connection to the water with every stroke of your paddle. This is the place to make summer memories, teaching your kids to fish for Dolly Varden and rainbow trout, and or to perfect a cannon ball right off the end of the dock. Summers at the lake mean meals are cooked over an open fire, and the stories of each day’s adventures are told and retold over campfires well into the night. You’re welcome to stay awhile — local resorts rent private condos and RV campsites. Pitch your tent at one of four recreation sites around the lake and spend days in the sun and your nights under the stars, quietly listening while nocturnal movements deep in the woods kindle your imagination. Not interested in camping? Rustic lakeside cabins are available for rent. The sound of slamming screen doors, creaking wooden floors and the smell of a campfire will bring you right back to hot summer nights spent at Mabel Lake long after you’ve returned home. Even water babies have to dry out sometime and when you’ve had enough water-logged fun, there’s still lots to see and do around here. Bring your clubs for a round of golf on the Les Furber designed par-36, 9-hole course. Explore the Kingfisher Interpretive Centre and learn the ins and outs of a salmon hatchery. Pick blueberries or buy fresh baked pies at Mabel Lake Farms or head to the Kingfisher Community Farmers Market on Wednesdays throughout the summer for locally grown fresh fruits and vegetables. Of course, you may just opt to simply chill out by the shore, recapturing memories of your summers gone-by when the days were long and carefree…and that’s okay too!